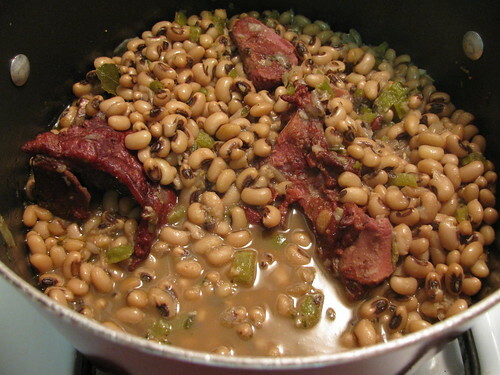 Right after New Year’s Day 2010, I started seeing a bunch of food blog posts about the traditional NYD southern dish, Hoppin’ John — a black-eyed peas and rice dish simmered with onions and some sort of pork, which is supposed to bring good luck. Having been born and raised in southern California, by parents also raised in southern California, I’d never heard of, much less tried, Hoppin’ John. But, the historian in me was intrigued. Plus, I’m very into food themes and traditions. So, I was bummed to have missed out on my opportunity to celebrate the New Year with Hoppin’ John and vowed to right this tragic wrong next year. Which, brings us to this New Year. Not really knowing where to start, I figured that I couldn’t go wrong with a chef associated with southern cuisine. I chose Emeril’s recipe. When I asked my Twitter buddies about what one should serve with a traditional Hoppin’ John meal, I was told greens, cornbread and smoked ham — so we did just that… using our leftover Christmas smoked port-glazed ham (blog post pending) and our delicious jalapeno cornbread muffins. The greens turned out too salty, but the Hoppin’ John turned out delicious. 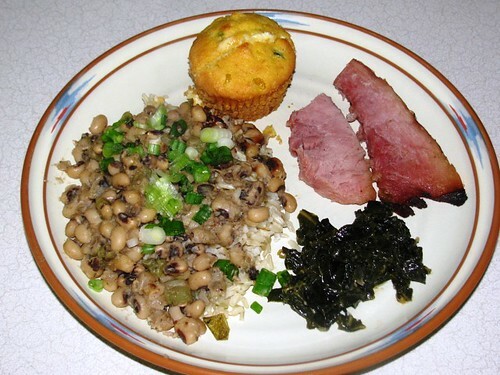 The Hoppin’ John is a total keeper for New Year’s Day 2012, and I may take another stab at those greens! I enjoyed a full-sized (meal) serving of this on New Year’s Day — with all of the above. But, for lunch at work yesterday, I simply reheated a side dish serving over 1/2 cup brown rice and threw in one diced up smoked skinless chicken thigh — equally delicious and satisfying, but for less Points. Pretty simple ingredients — just make sure you soak the black-eyed peas overnight and drain. Heat oil in a large soup pot, add the ham hock and sear on all sides for 4 minutes. Add the onion, celery, green pepper, and garlic, cook for 4 minutes. Add the black-eyed peas, stock, bay leaves, thyme, and seasonings. Bring to a boil, reduce the heat and simmer for 40 minutes, or until the peas are creamy and tender. Remove the bay leaf and ham hock before serving. Traditionally plated with ham, greens, and cornbread. 1 large ham hock (we removed this after simmering, so I didn’t count Points). Bring to a boil, reduce the heat and simmer for 40 minutes, or until the peas are creamy and tender, stir occasionally. If the liquid evaporates, add more water or stock. Adjust seasonings, remove the ham hock and bay leaf, then garnish with green onions. Yield: 6 main dishes or 10 side dishes. I’m a vegetarian, but still made a version of hoppin’ john and greens for New Year’s (I grew up in the South). I highly recommend Cooking Light’s recipes for Hoppin’ John’s Cousin & Braised Kale…so good!